Landsat image of sand dunes encroaching on Nouakchott. 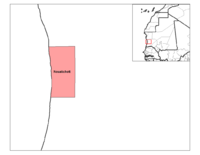 Nouakchott (Arabic: نواكشوط or انواكشوط [alleged translation from berberic "The place of the winds"] Nawākšūṭ) is the capital and by far the largest city of Mauritania, and is Sahara's largest city if one excludes marginal cases like Cairo (in the Nile River Delta) and the cities north of the Atlas Mountains on Africa's northern coast. 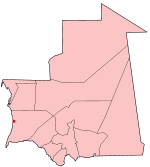 The city is the administrative and economic centre of Mauritania. Located on the Atlantic coast of the Sahara Desert, it lies on the west coast, on the Atlantic Ocean, although with the exception of Nouakchott Wharf and a deep water port, the coastal strip is mostly left empty and allowed to flood. Due to the rapid build-up, the city is quite spread out, with few tall buildings. It also often acts as an interface between urban Mauritanians and their nomadic fellow citizens. Nouakchott is built around a large tree-lined street, Avenue Abd an-Nasir, which runs northeast through the city centre from the airport. Other major streets are named (in French) for notable Mauritanian figures, or international personages of the 1960s: Avenue de Gaulle, Avenue Kennedy, and Avenue Lumumba, for example. Temperatures range between 33°C (92°F) and 13°C (56°F), and the average rainfall is 178 mm (7 in) per annum. As a tiny fishing town until 1958, Nouakchott has little history to mention. One event of note is the possibility that the Berber Muslim Almoravids are originally from the area. Mauritania was part of the larger French colony of French West Africa, and as such had no capital during the colonial period: Saint-Louis, in Senegal held that position. In 1957, however, this small port town -- when it was selected, an ambitious building program was begun to increase its population to 15,000 -- was chosen to be the capital of the new country. In 1958 Mauritania was formed as an autonomous republic in the French Community, and when that organization became moribund after 1962, Nouakchott became the capital of an independent country. The city has had explosive growth driven by the north African drought since the beginning of the 1970s: many have moved to the city in quest of a better life. The town was first divided into districts (moughataa) in 1973. First it was divided into four. From 1986, the city has been split into nine districts. For comparison, its population was only 20,000 in 1969 and 150,000 in 1980. Part of the difficulty in estimating the city's population is that part of it is literally nomadic: setting up tents in suitable locations, then packing up when the need strikes. Nouakchott has a deep-sea port, opened in 1986, primarily used for imports. Annually, imports account for around 96.4 % of traffic at the port. A 1,100 km road connects the city with Néma via Boutilimit and Kiffa . The city also features an international airport. Although the rocks beneath the city contained a vast reservoir of fresh water, known as the Trarza Lake, fresh water is running out due to the large growth of the city. The city is home to the Université de Nouakchott, which is the only university in Mauritania and was opened in 1981. Other higher education facilities include the National School of Administration, and the National Institute of Advanced Islamic Studies. There are many primary and secondary schools, and an American International School of Nouakchott. Attractions in Nouakchott include Nouakchott Museum, several markets including Nouakchott Silver Market, and the beaches, one of which is a base for fishing boats. The city also hosts the National Library and National Archives.